Nursery rhyme diaper cakes are a wonderful way to set the tone for your baby shower. These creative gifts for the mother to be make wonderful centerpieces for your gift or food table. Imagine a beautifully decorated nursery rhyme diaper cake surrounded by all sorts of deliciously prepared nursery rhyme recipes. They can really be the finishing touch to your theme. So let's talk about how you can use your creative imagination to "bake" a most unique and appreciated gift. Select a nursery rhyme that fits with the gender of the baby. Or if you don't know, you can always choose a generic type theme. If you know the color scheme or theme that the mother to be has chosen for her baby room, you can select nursery rhymes that can fit into that color or theme. A Wise Old Owl - adorable owl prints are perfect for this cake! Little Boy Blue - select items to decorate your cake in shades of blue. Receiving blankets, onesies, baby bottles, infant washcloths, baby booties, teething rings, cloth ribbons all help to create a beautiful blue cake. Old McDonald Had A Farm - there are all sorts of animal prints that can be incorporated into crib sheets, sleepers, blankets, stuffed animals. Farm animal mobiles for the crib, night lights and more. A Sailor Went to Sea - sailboats in prints for the walls, mobiles, wall murals, fish and starfish. 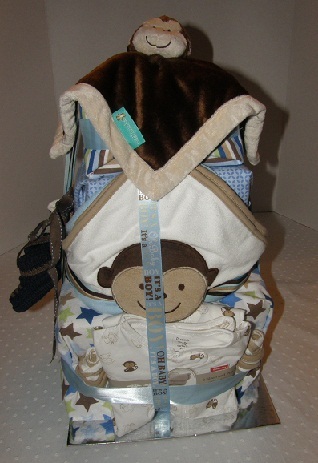 Five Little Monkeys - monkey printed sleepers, bath towels, robes, blankets, stuffed animals. Hey Diddle Diddle - cows, moon, stars, dogs, cats, fiddles - such a list of items to choose from to create a totally fun cake! There are all sorts of ideas that you can use to incorporate a nursery rhyme into the theme of your diaper cake. Share your creative diaper cake recipe with us! Have you created your own unique and delectable diaper cake recipe? Share your wonderful creation with the us and get even more of those well deserved "ooohhh's" and "aaahhhh's". Not only will you be sharing your creative genius with lots of women in the world, you will automatically be entered in our Diaper Cake of the Month contest. What did you call your one of a kind creation? Entering your story is easy to do. Just type!...tell us what inspired you, what ingredients you used, how you held the batter all together! This is your recipe, tell us how you created your masterpiece. Share pictures of how you assembled your cake. Especially the finished product. Close in all those delicious details. All you have to do is click the button and find the first photo on your computer. Select it and click on the button to choose it. Diaper Cakes - the most useful and creative new baby gift! Diaper Cake Ingredients - basics needed to "bake" your cake! 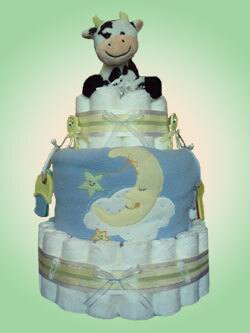 Candlestick Diaper Cakes - the most popular style of diaper cake! Square Diaper Cakes - easy as pie to create this wonderful cake! Wrapped Diaper Cakes - simple as it sounds! 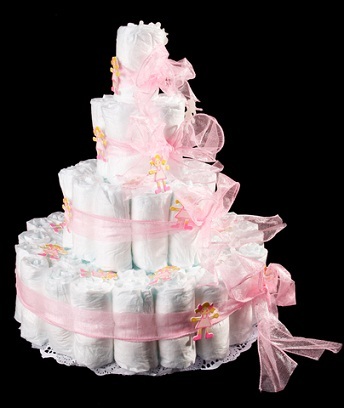 Diaper Cake of the Month - a fun creativity contest! 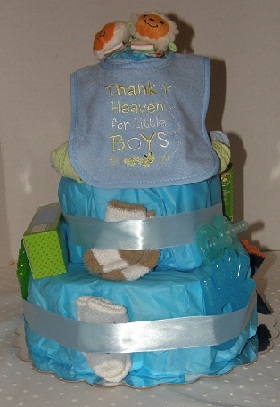 Little Boy Blue Diaper Cake - blue is perfect for baby boys! Wise Old Owl Diaper Cake - adorable for a baby girl! Nursery rhyme themes always make for unique baby gifts! Beautiful handmade baby quilts are the perfect baby blanket for those special little ones. 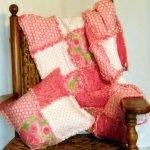 At Quilted Rhymes you'l find cherished handmade baby rag quilts and more! Like us on Facebook! Tell your friends about us! Don't miss the new stuff! I promise to use it only to send you Grandma's Nursery Rhymes. Click the pic to read our story!